Stars of CMT’s hit television series Nashville will celebrate the city that they dramatically have brought to life and their home for six seasons with the NASHVILLE In Concert: Final Season Celebration at the Grand Ole Opry House in Nashville, on March 25. 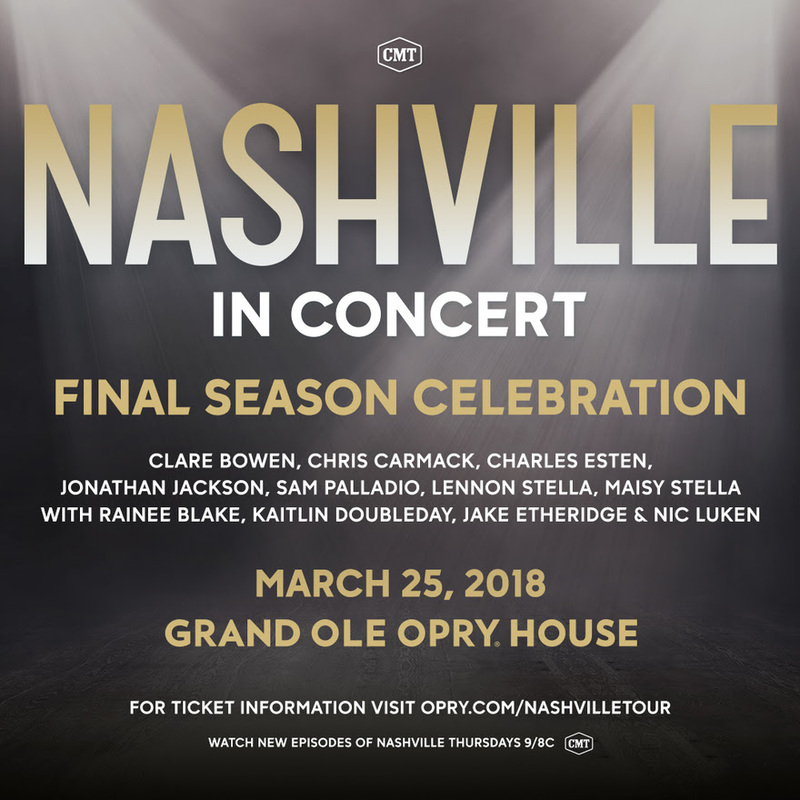 CMT’s NASHVILLE In Concert: Final Season Celebration will feature cast members Clare Bowen, Chris Carmack, Charles Esten, Jonathan Jackson, Sam Palladio, Lennon Stella, Maisy Stella as well as Rainee Blake, Kaitlin Doubleday, Jake Etheridge and Nic Luken. Tickets and VIP Packages for NASHVILLE In Concert: Final Season Celebration at the Grand Ole Opry House will go on sale February 2 at 10 am at opry.com/nashvilletour. Cast members Clare Bowen, Chris Carmack, Charles Esten, Jonathan Jackson and Sam Palladio will head to the UK and Ireland in April for the NASHVILLE Farewell Tour as well. The shows will feature songs from the series as well as artists’ original material, and tour stops include Birmingham, Leeds, Glasgow, Manchester, Cardiff, London, Dublin and Belfast. Due to exceptional fan demand of the shows in the UK and Ireland, additional seating had to be opened up for the London O2 show on April 21 and shows were added in Dublin and Belfast for April 23 and 24 respectively.